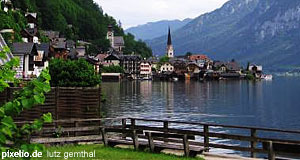 Hallstatt is a city in the province of Upper Austria that was made a World Cultural Heritage site. The historic town is considered to be the cradle of civilisation in the Salzkammergut area, and it gave its name to an entire period of the Neolithic age: The "Hallstadt Age". The town is situated by a lake, but the salt mines that attracted the earliest settlers some 7,000 years ago are about 300 metres up the mountains in a so-called "Hochtal" or "high valley". The mines are the oldest salt mines in the World and many archaeological findings were made here and in the excavation sites in the town itself. About 5,000 bodies were buried in a Neolithic cemetery of Hallstatt. If you go to the "Salzwelten", the "Salt Worlds", get ready for a theme park that will provide you with information on the history of salt and its production, and entertainment for children and adults alike. An underground hall is 4,200 square metres big, there is an artificial lake and even dwarf miners that collect crystals to the great delight of observing children. Highlights of the exhibition are the oldest tool found in the mines, a 5,000 year old device made from antlers, and of course the "Mann im Salz", the "Man in the salt"! In 1734, three miners got caught in an abandoned tunnel. There they found the body of a fourth man, which they carried out of the mine. The locals realised that the clothes of the man were very old and nobody could remember him. However, they did notice that the body smelled odd, "like feet", as they described it. Since the man was most likely no Christian, he was buried nearby but outside of the local cemetery. Then he was forgotten for about 100 years. Finally, a local businessman started the first excavations in Hallstatt and thereby opened one of the most elucidating windows to Neolithic times. Another attraction of Hallstatt is the "Beinhaus": due to spatial constraints of the town, corpses were "accommodated" on the local cemetery only for a limited amount of time, after which skull and bones were dug out, painted in decorative colours, and stored in the Beinhaus. Today, it hosts quite a number of skulls. Hallstatt is rather difficult to access from Salzburg, the most efficient way to get there is probably by bus with a travel agency. A journey by train and public busses is of course possible and cheapter, but will involve changes, so plan in advance and get some advice from the tourist information centre or at the ticket office at the Salzburg central station.